IT IS HARD TO SAY when the quest began. Until he turned 29 and took the pastorate of the French refugee church in Strasbourg, he hadn’t much time to think about marriage. Besides that, he once wrote, “I shall not belong to those who are accused of attacking Rome, like the Greeks fought Troy, only to be able to take a wife.” So he was in no hurry. Calvin, too, realized that he needed somebody to take care of him. When he moved out of the Bucer “inn,” he rented a house for himself, his brother, his stepsister and some student boarders. He found it a strain, not only on his time but also on his sanctification, to manage a boarding house and serve as a pastor of a growing church. It was another reason for needing a wife. So he told his associates that he was now in the market for a wife and that he was open to any suggestions. In fact, Calvin seemed so convinced that the next step in his life during 1539 should be marriage that he reserved a date “a little after Easter” with his friend William Farel, whom he wanted to officiate at the ceremony. We don’t know whether he had a particular bride in mind. But a few months later the first candidate was brought forward. She was a wealthy German woman, who had a brother serving as her campaign manager. A strong supporter of Calvin, the brother argued that such a marriage would be most beneficial. Calvin had often said that he wished to live the life of a scholar. Since royalties from sales of theological books would not provide much of an income, it would be helpful for him to have a wealthy wife. Farel had his own candidate to suggest. She spoke French and was a devout Protestant, but was about fifteen years older than Calvin. Calvin never followed up on this one. The next candidate spoke French and didn’t have any money, but was highly recommended by friends. Calvin seemed interested, enough to invite her to Strasbourg for an interview. 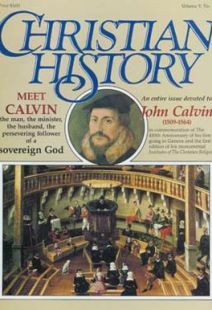 Calvin again alerted Farel, “If it come to pass, as we may certainly hope will be the case, the marriage ceremony will not be delayed beyond the tenth of March.” The year is now 1540; Calvin is now 31. “I wish you might be present, that you may bless our wedlock,” but then Calvin added, “I make myself look very foolish if it shall so happen that my hope again fall through.” But fall through it did. But when he stopped seeking, he found. In his congregation of refugees was a young widow, Idelette de Bure Stordeur. She, her husband, and their two children had come to Strasbourg as Anabaptists. Listening to John Calvin’s faithful exposition of Scripture, they were converted to his Reformed views. Jean Stordeur, Idelette’s husband, had been an Anabaptist leader, and undoubtedly John Calvin had discussed theological matters with the Stordeurs in their home. In 1537, when Calvin was still in Geneva, Stordeur had come to that city to debate with the Reformers there. Stordeur lost the debate, was ordered out of Geneva, and returned to Strasbourg. Undoubtedly, the discussions continued when Calvin arrived in Strasbourg two years later. Eventually, Calvin’s use of Scripture convinced the Stordeurs in most of their areas of difference, but not all. In some, perhaps, Calvin tempered his own thinking. But soon the Stordeurs were in Calvin’s church, partaking of the Lord’s Supper; after further discussion, they had their son baptized by Calvin; eventually, the entire family became members of the church which now numbered nearly 500 refugees from France and the Low Countries. Then, in the spring of 1540, Jean Stordeur, stricken with the plague, suddenly died. Idelette grieved for the loss of her husband; John sorrowed for the loss of a friend. It was at this time, as John Calvin had almost given up thoughts of marriage because of the string of fiascoes, that his pastor-friend Martin Bucer said to him “Why not consider Idelette?” John did. Idelette was attractive and intelligent, a woman with culture, apparently from an upper middle-class background. She was also a woman of character and quiet strength. It didn’t take much time for the Reformer to pen another letter to William Farel, asking him to come and perform a wedding ceremony. This time it was no false alarm, and in August, John and Idelette were married. Idelette was perhaps more concerned that her children have a good father, and John was relieved to have finally discovered a good wife. Her first major adjustment was to move into Calvin’s student boarding house and learn how to cope with a sharp-tongued housekeeper. In his writings, John Calvin did not say much about his personal circumstances and even less about his wife—certainly not as Martin Luther did—but nevertheless you get from his letters a glimpse of Idelette as a wife who deeply cared for her husband as well as for her children. His biographers speak of her as “a woman of some force and individuality,” and John himself described her as “the faithful helper of my ministry” and “the best companion of my life.” He certainly was not disappointed in marriage. Though he delighted in her company, during the first year of their marriage he didn’t have much of it. After their stint in their sickbeds, John had to travel, leaving his bride to cope with the boarding house problems as well as her two children. He was not eager to leave, but Emperor Charles, the ruler of the Holy Roman Empire, had called the leading Roman Catholic and Protestant scholars together to discuss how they might stop their bickering and form a united front against the Turks, who were menacing his empire. Three months later he arrived back home for a month before going to another conference called by the Emperor. “I am dragged most unwillingly,” he wrote, but he went. While attending the conference, he received news that a plague was ravaging Strasbourg. He was concerned. “Day and night my wife has been constantly in my thoughts,” he wrote. He realized that just as the plague had taken her first husband only a year earlier, so it could now take Idelette, who was still weak from illness. He wrote, urging her to leave Strasbourg until the plague was over. But Idelette had already taken action. She had taken her children and moved in with her brother Lambert. Lambert had been a wealthy landowner in Liege before he was forced to flee, leaving behind everything he had. But in only a few years in Strasbourg, he had once again become an honored citizen. Later that year, John was called to another conference. He and Idelette were separated for 32 of the first 45 weeks of their marriage. But in September 1541, John headed toward Geneva to see if there was any reason why he should change his mind. “I offer my heart to the Lord in sacrifice,” he wrote. Idelette stayed behind in Strasbourg until he determined whether Geneva would be safe for her. Geneva showered gifts on him. “There was a new robe of black velvet, trimmed with fur. And a house on Rue de Chanoines, a short narrow street near the cathedral. At the back of the house was a garden which overlooked the blue lake.” Then the Council sent a herald and two-horse carriage to bring Idelette, the children and all the family furniture from Strasbourg to Geneva. It was a traumatic move for Idelette as well as for John. Strasbourg had become home for her and her children. Her brother and his family were there as well. All she knew of Geneva was what John had previously experienced there, and it all sounded like more uncertainty and confusion, if not trial and tribulation. But she went. And when she began settling down in the new house at Number 11 Rue de Chanoines, she was pleased. It was nothing like the crowded boarding house in Strasbourg. The city council had loaned furniture to them, because they had very little of their own. Behind the house was a vegetable garden, which Idelette planted each year. She also planted herbs and flowers which scented the air. When guests came, John proudly took them out in the back yard to show off Idelette’s vegetable garden. Three years later, a daughter died at birth, and two years after that, when both John and Idelette were 39, a third child was born prematurely and died. Then Idelette’s physical problems worsened. Coughing spells dragged her down. While life in Geneva was better for John Calvin the second time around, it still was difficult. He had as many enemies in the city as he had friends. Some of the citizens called their dogs “Calvin.” What angered John more, however, was when the insults touched Idelette. Idelette’s first marriage to Jean Stordeur had never been solemnized by a civil ceremony, because Anabaptists felt marriage was a sacred ceremony, not a legal act. Hence, years later in Geneva, the gossips in Geneva spread the word that Idelette was a woman of ill repute and that her two children had been born out of wedlock. John Calvin and Idelette were now unable to have children, the gossips said, because God was punishing them for her previous immorality. Despite her poor health, Idelette tried to keep John on an even keel. Friends remarked that John was in better control of his temper, in spite of various provocations. No doubt, Idelette defused numerous explosions. She was still in her 30s when disease, probably tuberculosis, began wasting her. In August 1548 John wrote, “She is so overpowered with her sickness that she can scarcely support herself.” And in 1549, when she had just turned 40, she lay dying. She had been married to John for only nine years. On her sickbed she had two major concerns. One was that her illness should not be a major hindrance to John’s ministry. The other was her children. William J. Petersen is senior acquisitions editor at Revell Books.